Karel Capek published Rossum’s Universal Robots in 1921, simultaneously inventing the word Robot, and creating a science-fiction tradition in Czechoslovakia. Robot is derived from the Czech Robota – which can mean work you don’t really want to do, or work that is tedious. 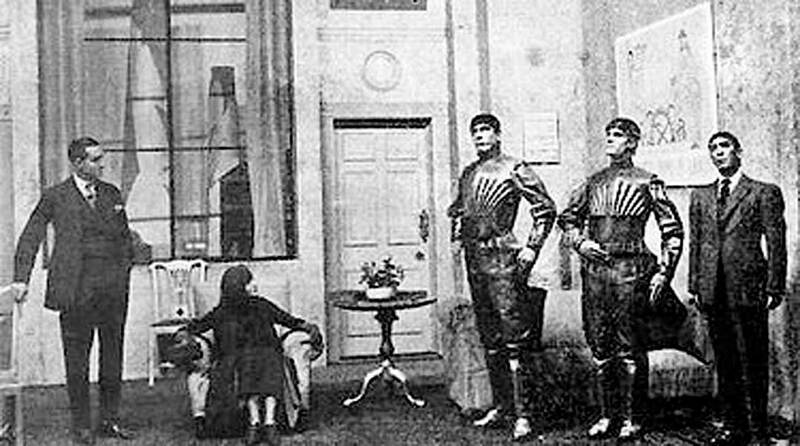 His play has been performed around the world, and the word Robot was subsequently made really famous by Isaac Asimov in the 1940s (stories collected as I Robot 1950). 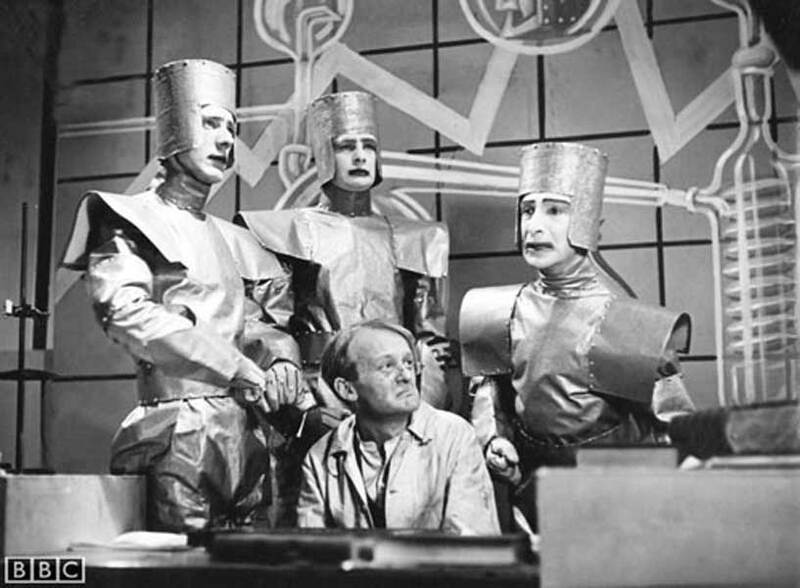 In 1938, the BBC’s nascent Television Centre produced a version of RUR (picture below). Early 1920s – an early production of the play RUR. By the 1940s the word Robot was popularised world-wide by the American sci-fi writer Isaac Asimov, who writes a series of books featuring advanced robots including I, Robot, and invents his Three Laws of Robotics. During the period 1950-2000, robots went from fiction to fact, a causal chain perhaps beginning with Grey Walter’s Tortoise autonomous robots in 1949. Coeval with Robotics, the science of artificial intelligence (including machine-vision, machine reasoning, voice-recognition, speech synthesis, Turing-test programming, software agents, etc etc) developed and splintered into a variety of sub-specialisms. From the late 1940s, we have another parallel and overlapping science – that of cybernetics – ‘command and control in man and the machine’ (Weiner 1948). It was the convergence and synergetic outcome of these three disciplines (robotics, AI and cybernetics) that put us on the road to the eventual creation of what Hans Moravec calls an ultra-intelligent machine. In 2013 alone, 179,000 industrial robots were sold worldwide. This was not only the first real science fiction classic, it was the most expensive silent film ever made, costing approximately 7 million Reichsmark. Fritz Lang had been inspired by a 1924 visit to Manhattan. “I saw the buildings like a vertical curtain, opalescent, and very light. Filling the back of the stage, hanging from a sinister sky, in order to dazzle, to diffuse, to hypnotize.” The film is set in the future (2026), when mankind is split into two interdependent factions: the thinkers who plan and live in luxury but have no technical skills, and the workers who live underground creating the wealth that the thinkers benefit from. The screenplay was co-written in 1924, by Lang and his wife and long-term collaborator Thea von Harbou, it seems to borrow ideas from Capek’s RUR (1921), and echoes themes of HG Wells The Sleeper Awakes and Mary Shelly’s Frankenstein. The film was originally 153 minutes, but was cut for release in USA, and subsequently about 25% of the original has been lost. However, with current releases on DVD (and versions on youtube) you at least get some idea of the immense vision of the original – the dramatic robot and the cityscape sets are spectacular. The spectacular transmutation of robot and woman (Maria) are still powerful optical effects.